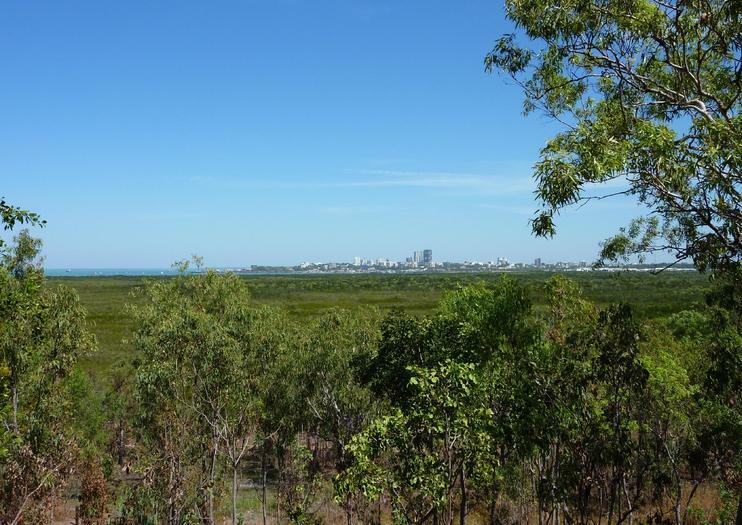 Protecting some of Darwin’s most cultural and historically significant wetlands, Charles Darwin National Park is the home of mangroves and wildlife visible by walking, cycling, or simply sitting at one of the park’s many overlooks. A complex system of bays, waterways, and small islands, 31 of the 50 or so species of mangrove of the Northern Territory can be found here. Historically the Larrakia people called this area home with evidence suggesting the Aboriginals had inhabited here for thousands of years. Now it’s a wonderful place to take in views of Darwin city, the harbor, and the surrounding landscape. The park is also home to concrete bunkers and shelters from World War II, which tell the story of Australia’s soldiers and are open to visitors. There is an impressive display of war memorabilia here, where ammunition was once stored and military tests were run. The park’s many paths can be used for both walking and cycling to take it all in. To get there take Tiger Brennan Drive east from downtown Darwin — there are signs from the highway identifying the park entrance (about 5 km out,) which is only open during daylight hours. Explore the ancient history and modern vibrancy of Darwin on a half-day sightseeing tour. Travel by coach and listen as your local guide shares commentary about the tropical city’s natural and cultural attractions. Delve into Aboriginal art at the Museum and Art Gallery of the Northern Territory, and stroll past fragrant orchid blooms at the Botanic Gardens. Upgrade to cap off the day with a sunset cruise through Darwin Harbor while enjoying a fish-and-chip dinner with sparkling wine. Absorb more of Darwin’s spectacular cityscape and coast in less time on a 20-minute helicopter tour of the Hidden Valley Motor Sports Complex and the Port of Darwin. In a private party limited to four, you’ll absorb aerial views of the Charles Darwin National Park and get a birds-eye view of Darwin CBD's modern architecture and the Larrakeyah Barracks. See, too, an array of white-sand beaches and the Hidden Valley Motor Sports Complex, home to Australia’s V8 super championships series.